When it comes to canning food, a high amount of pressure is needed to ensure that the meat and vegetables are soft enough to be consumed at once. However, the pressure shouldn’t be too much as this may cause the delicate fibers in meats and vegetables to become too soft and then disintegrate. Is home pressure cooking and canning of large food quantities something that you would like to do in the comfort of your home? Then the All American 921 21-1/2-Quart Pressure Canner may be the ideal pot for you. Imagine you’re a busy homeowner who has to work for eight hours a day, and when you get home, you still have to prepare a meal for your family. Aside from being too tired to prepare your own meal, you’d also be very hungry! With the All American Quart Pressure Cooker/Canner, you can stop worrying about what your family will eat since you can prepare the meals beforehand. 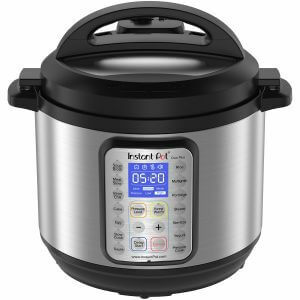 Its pressure cooker function allows you to cook tough meats in a matter of minutes. In addition, the it allows you to can food so you can easily access ready-made meals in an instant. Just imagine the convenience of giving your family a nice home cooked meal without preparing it right when they need it. The 20-quart All American Quart Pressure Cooker/Canner is capable of holding up to 19 pint jars or 14 quart jars. It’s made of durable hand-cast aluminum for fast even heating and insulation all throughout its pot. As it’s made of lightweight aluminum, it’s much lighter than it looks! It has an exclusive metal-to-metal sealing system for a steam-tight seal. Instead, it has positive action clamping locks and screws to keep the cover aligned to the base for a tight and sturdy seal. It doesn’t have a gasket so opening and closing the lid is easy. It has a geared steam gauge, and automatic overpressure release to show you just how much steam is inside the pot as you’re cooking. It has three pressure regulator weight settings: 5 psi, 10 psi, and 15 psi. Its edges are super tick for additional protection, and its sturdy exterior allows for constant usage and heavy wear. Its handle is stay-cool Bakelite so you won’t accidentally burn your fingers when handling the lid. As it can hold 14 quart jars, you can put more than one layer of jars in the canner. It has two trays/shelves for holding two layers of jars. 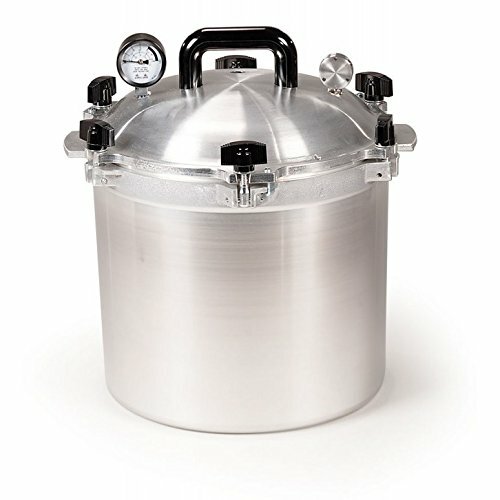 The entire All American Quart Pressure Cooker/Canner is roughly 17 inches wide by 17 inches deep by 20 inches tall (including the handle). Its total weight is 29 pounds. It’s heavy duty and very sturdy, so even if you use it multiple times a week, it will still give you the best results. It’s made of aluminum, so it heats food evenly. In addition, it’s relatively lighter than stainless steel pressure cookers of the same capacity. It doesn’t require the use of a gasket since its metal-to-metal seal clamps and screws securely into place. You can use it at pressures of 5 psi, 10 psi or 15 psi, so even if your meat is tough yet delicate, you won’t have problems with disintegrating meat. The handle is insulated and stays relatively cool throughout cooking. There’s no threat of burned fingertips when you lift up the lid after cooking. You can put two layers of quart and half-quart jars as it has two trays to accommodate them. It’s the best pressure cooker on the market that can handle such a huge amount of food. It’s quite heavy, with a weight of 20 pounds. However, this is also a testament to its sturdiness. Besides, if you can cook up to 14 quart jars, you’d probably expect it to be heavy anyway. Due to its weight, it’s not recommended for use on ceramic or glass stoves. Due to its thick material, it may take some time for the entire pot heat up or to be cool enough to handle. But you can run cold water over its body to speed up the cooling process. In terms of pressure cooker ratings, this has gotten an excellent one alright. A true top-notch in the best pressure cooker reviews. Garnering an almost perfect rate from more than 1145+ consumers, you can say that this surely is one of the best pressure canners. This has an automatic overpressure release feature so you will never be scared of explosion at all. Think of several cooking and constant use, this is one’s a heavy-duty that can cater to your needs anytime you need it. Its huge capacity makes it suitable for canning which can be pretty helpful when you plan of storing foods to be consumed after a certain period of time or just to simply prepare a huge meal for a bunch of people. Finally, if you look at the product, it is pretty plain and simple in design, so it is just simply user-friendly. Can I use this product on a ceramic, flat top or gas stove? – Yes! Based on one review, this canner works best with flat burners. It has a flat raised inner section of the of its base that fits well any large flat glass cooktop. The sides are raised at about half an inch too so it definitely will not ruin your glass cooktop. It’s a perfect canner with a lot of safety features built on it. Is it safe for canning seafood and meat? – It definitely is! All you have to do is to fill the canner with enough amount of water so it will work well for a longer processing period. Is it safe to cook with an aluminium material? – If your concern is about the aluminium chipping off and mixing up with food, then that would probably happen but after a long period of time or after years of using the pot. Although, if you are still hesitant about the safety of it, just avoid cooking acidic foods on it then. As this type of material just highly react with acid. Anyway, the topic is well covered on the instruction booklet so basically a precaution is already advised before you use it. Does the canner come with a recipe book? – No, it does not. But anyway, there are a lot of recipe books available online for reference and a lot of them are sold at bookstores at a very cheap cost so it is not really a very big deal.